Sukhumvit Soi 53 (“soi” is Thai for an alley or small street) is one of the nicer sois in Bangkok. There are generally walkable footpaths on both sides of the soi and several trees provide shade. 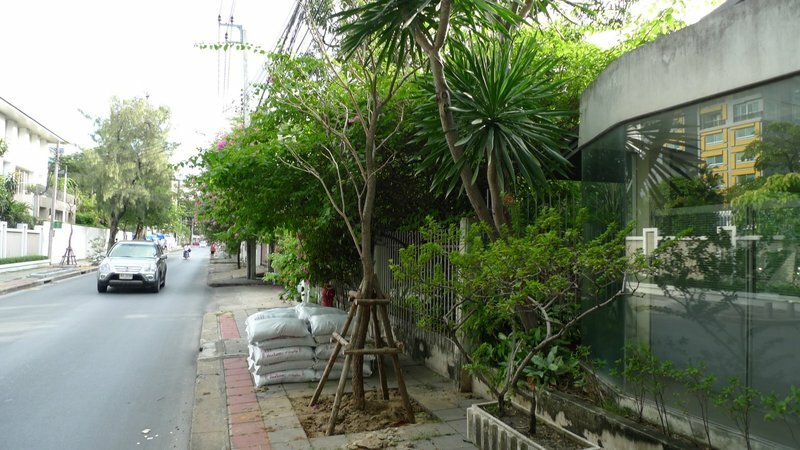 So it was a surprise when, in a flurry of unexplained activity, green Bangkok Metropolitan Authority trucks descended upon our soi, removed footpath pavers, and planted hedge rows and new trees the entire length of the soi. Not that I mind the extra attention and new landscaping, although it is rare to see government landscaping that is actually set into the soil – potted plants seem to be the norm. But this landscaping project doesn’t seem to be happening anywhere else, just on our already better-than-average soi. That seems suspicious. Tawn and I spoke to the workers in front of our condo, who didn’t know much other than they were following directions from their superiors. This shot captures both the full range of landscaping being added – tall hedge rows in the back, trees in the middle, and short hedge rows in the front – as well as the asinine lack of planning resulting in some areas in an entirely blocked footpath. “What could be going on?” I wondered to myself. 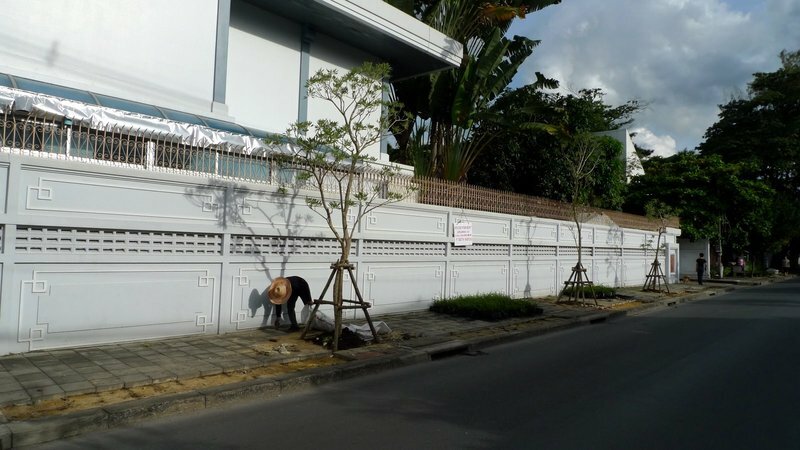 In some stretches of the soi, such as this barren patch, the new landscaping was a welcome addition. You can see where pavers have been removed near the curb in order to add hedge rows. The irony is that a few weeks later, these trees and the hedge rows in front of this house have been inexplicably removed. 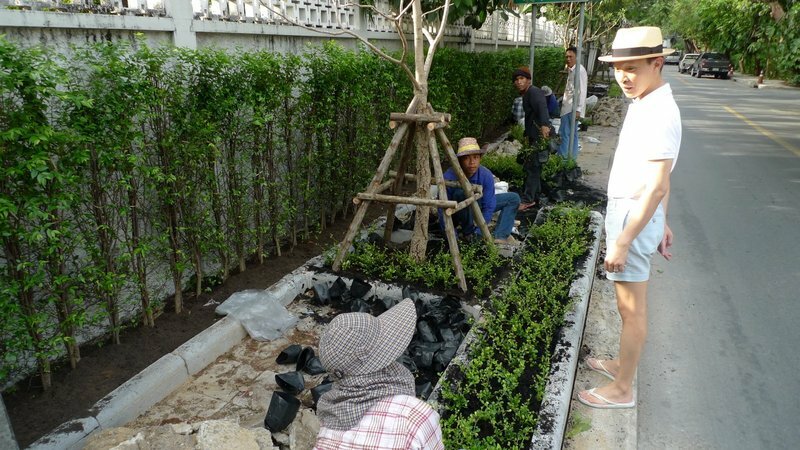 In other areas, trees and hedge rows were being planted right in front of properties that already have very lush foliage. This seems a bit wasteful to me. The tall trees you see in the distance of this photo, the ones on the left-hand side, are pine trees. Some of them have been cut down as part of this process. While we were viewing the planting, a neighbor came up and shared some gossip with us. The landscaping has been done because a very important person is moving into the soi. So important that, because of Thailand strict lese majeste laws, I can’t tell you who. It has been three weeks since the landscaping and I haven’t seen any signs of the pomp, circumstance, and police that one would associate with that sort of VIP. But it seems likely that this one-off landscaping which isn’t happening anywhere else in our neighborhood, must be the result of someone important. We’ll see if the rumors come true. Perhaps more importantly, we’ll see if the landscaping lasts. This entry was posted in Uncategorized and tagged Bangkok, Krungthep, Landscaping, planning, Soi, Sukhumvit, urban by christao408. Bookmark the permalink. Wow that’s nice. Government-sponsored landscaping. I want some of that. Somewhat uncoordinated landscaping but greenery is greenery. I just wished they gave it some thought and planning. P.S. you need to get Tawn to eat a bit more. He barely casts a shadow. On the contrary, I think Tawn looks very cute as is ^^I just find the whole thing wasteful.Hate knee jerk reaction stuff… it won’t last. I love greenery but coordinated planting would be nice. They do a good job here of mapping out a plan for planting. Someone has an eye for making our streets and paths look good. Ha ha ha… guess what? It’s for me Chris. Remember I am coming to visit you? j/k When I started reading your post, I thought to myself that perhaps someone important was visiting that area. That’s what they do in India also. Fortunately for us, the mayor lives a few doors down on our street, and our street is well maintained. @ZSA_MD – Your street is very well maintained, especially your rose garden! Yes, I must have told the local gov’t about your impending visit and surely that is why they decorated. Ha ha…@yang1815 – No! We’re all Republicans now and are cutting all spending, including for shrubbery. @ElusiveWords – @ZenPaper – Hmm… you guys have to decide, too skinny or not? He actually isn’t super-skinny like some of those stick-thin kids from the countryside here. But he does a lot of yoga so he has a lean frame. @murisopsis – Oh, we have a fleet of snowplows standing by. They’re getting a little rusty, but they are there just in case! @Fatcat723 – Central planning is definitely not a strength of Thai governments. @christao408 – How about that thing called war? @yang1815 – Um, no, that’s off the table. That’s national defense. Those Iraqis may use their weapons of mass destruction to bomb America. hahaha that sounds like some of the crazy things that go on around this city… like how one group comes through and paves the roads or the sidewalk and then the utility company comes through and digs it back up to install something underground. seems like these agencies need to plan and coordinate a little better. still, it is always nice when the end result is more greenery, especially in the city. @christao408 – They had one?! That’s a very nice soi indeed, I have seen some really narrow soi’s in BKK, barely enough for one car to pass by. I think Tawn has maintained his physique very well, considering the amount of food (especially bread/pastries) you have cooked! Oh well, I guess he has a choice of going into a diet, right? @yang1815 – The former Vice President seems willing to keep saying they did. @CurryPuffy – When it comes to baked goods, Gary, I end up eating a disproportionate share. Sadly…@kunhuo42 – That “if you build it, another utility will come dig it up” thing seems to be a universal phenomenon, Aaron. Unexplained but inescapable. @christao408 – The one that shot someone with a shotgun wishing his daughter would eventually one day get married?